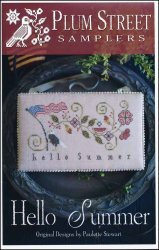 Hello Summer [D6864] - $10.00 : Yarn Tree, Your wholesale source for cross stitch supplies. Cross stitch pattern from Plum Street Samplers. Stitch count 150w x 83h. Stitched on Item 2239 Patriot's Brew 36ct Zweigart Edinburgh Linen. Item 2204 Vintage Mini PomPoms is used for the trim.